Use SearchExpress Document Management software to scan or import and manage both paper and digital documents, to save time and money. Drag and drop files into SearchExpress, from mobile device or PC, and optionally add index fields. This can be any type of file, Word, Excel, PDF, Video, etc. You can use a "Save to SearchExpress" Menu item in Word, Excel and Outlook to save documents to SearchExpress and optionally add index fields. You can save these documents in their native format, e.g., Word, or you can let SearchExpress convert the documents to an unalterable PDF file. When indexing documents, you can use database lookup. For example, enter a Customer Number and use the Lookup button to fill in the customer name and address, from any SQL or ODBC-compliant database. SearchExpress can automatically index and let you search all the documents on your computer or server. The documents are indexed by content, i.e., the text of the document, as well as by the file name and date. You can search by any word or phrase in the document, in conjunction with fields, such as date, to find the documents. You can import emailed documents using PC, tablet or smartphone. You can capture and index emails from Outlook, Gmail, Office 365 and other sources. SearchExpress uses machine learning to train itself to recognize data such as invoice number, date, and vendor name on invoices or other documents attached to the email. SearchExpress can use the From email address to identify a Zone OCR template to zone OCR the data on the attached document. Emailed documents can be automatically routed based on the From email address. Scan over LAN or over Internet. Put hundreds of pages in the scanner, and SearchExpress can separate the pages into documents, based on pattern recognition. Or, instead, you can use barcodes for document delimiters. Add new pages (append images) to existing documents. User-defined index cards let you optionally add index fields to your documents, such as date, source, and customer name. Write scanned documents to either BLOB fields inside the database, or write documents to Windows folders. SearchExpress can write scanned documents in either self-contained searchable (text plus image) PDF format or TIFF format. You can stamp a date or any index data field on each page scanned or imported. You can index documents before you import or scan them or during import and scanning. You can enter a Sales Invoice number, and SearchExpress can read the invoice fields, such as invoice amount and date, from your sales invoicing system, via an ODBC or SQL lookup. SearchExpress can perform automatic form recognition and zone OCR to read the invoice number, amount and date from the invoice. You can combine both of the above features. SearchExpress can use automatic form recognition and zone OCR to read an index field, such as an invoice number, and then use this invoice number to do an ODBC lookup to read the other index values for the document, such as date and amount. When entering data, there is a Duplicate checkbox next to each field. If “Dup” is checked on, the contents of the field are copied to the same field in the next document, when you go to the next document in that same batch. When scanning and importing documents, SearchExpress can capture Windows system variables into indexing fields. These include Windows login name, machine name and date and time. When scanning and importing documents, SearchExpress can check for duplicate documents, e.g., duplicate invoices. You can annotate (make notes on) documents. Speech Recognition lets you annotate documents using speech, instead of typing, which can be particularly handy when searching from a mobile device. Stamp Footer on Word and Excel files lets you write fields, such as "Checked in by", "Approved by", "Page Number" and "Uncontrolled when printed" to the footer of Office files. SearchExpress can import .CSV data files and related PDF or Text files. This lets you easily import your COLD files or other documents in which the related data fields are in a CSV file. COLD files, i.e., reports or documents printed from a Unix server or an IBM iSeries or AS 400 mainframe, are often text files with invoice or check data, but without the invoice or check form. 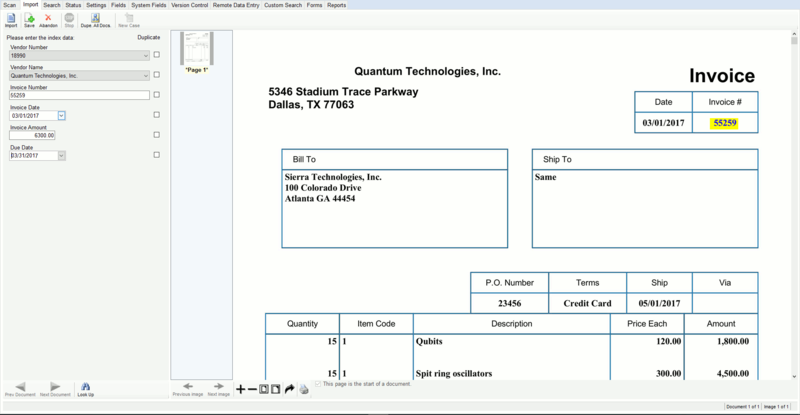 An image, e.g., of a blank invoice, can be overlaid on each page displayed, so you see the full invoice or check, not just the data printed from the mainframe. Stamp Text on Image during scan/import lets you write the date scanned, or any field, on an image, before the document is added to the SearchExpress database. Stamp Text on Image during display lets you write the date and time the image is being displayed, or the contents of any field, on an image, when the image is displayed or printed. SearchExpress Content Management provides document check-in/check-out and version control via your browser. SearchExpress maintains the original version of each Word, Excel or other digital document, as well as any revised versions. When revising Word, Excel and other documents, check-in/check-out protects against multiple people revising the document, and over-writing each other's revisions. Version control lets you roll-back to previous versions of the document. Content Management can be used for any type of digital document, including Word and other Microsoft Office documents, PDF, audio, video and scanned images. To help protect the documents, the documents are stored in a secure repository on your server. SearchExpress provides a manual check-in, whereby you can check-in documents as you revise them. In addition, SearchExpress provides a batch check-in, so you can check-in all your existing documents at one time. SearchExpress provides speech recognition to let you complete eForms using speech, instead of typing, which can be particularly handy from a mobile device. eForm pick lists, shown to the user, can be populated in real-time from live database links. The user can sign their signature on the eForm by using their finger, on an iPad or smartphone, or by using their mouse, on a PC. You can have multiple signatures on one eForm, and these signatures can be signed at different times by different people. The user can click translate to translate the eForm to any language. When designing the eForm, you can add images and text verbiage to the eForm. The eForm adjusts automatically to any device size: smartphone, iPad, PC. The user's login can be used to read data from a database and pre-populate an eForm. For example, when an employee displays a Vacation Request eForm, their Employee Name, Employee Number and the number of vacation days they have available can be pre-populated on the eForm. The geolocation can be used to read data from a database and pre-populate an eForm. For example, for Proof of Delivery (POD), the correct POD for that address can be read from your sales database and displayed on the delivery driver's iPad, and the recipient can sign their signature with their finger. Use eForms to securely accept credit card payments, e.g., a student could see their “Amount Due”, based on their email login, and pay by credit card. Completed eForms are saved to the SearchExpress document database, and can be searched by content. SearchExpress can also write the form data to your HR or ERP systems or other applications, via an ODBC call, or XML or CSV file. SearchExpress can use Artificial Intelligence (AI) to accurately read handwriting, including both cursive and print handwriting, e.g., hand-written doctor's notes and prescriptions. Use Artificial Intelligence (AI) to identify images by content. For example, we can train your system to detect product defects. Automatic route (workflow) documents and photos to appropriate personnel based on AI determined content. You can search for all documents by artificial-intelligence determined content. Automatically separate documents by using barcodes as document delimiters. Use up to eight barcodes as index fields to describe and help retrieve the document. You can use barcodes in a hierarchical fashion. For example, you could scan a barcode encoding a client number once, and scan a bunch of different documents for that client, putting in perhaps a document-type barcode for each document, without repeating the client (upper level) barcode. Optical Character Recognition (OCR) lets you find documents by content, that is, by words or phrases in the documents. Full-page OCR will OCR each word on the page. Rubber Band OCR let you highlight words on the image and copy them into index data fields. Automatic Form Recognition and Zone OCR let you automate Rubber Band OCR by letting you define zones and specify fields in which to automatically place the OCR'ed text for each zone. For example, if you have Proof Of Delivery documents with Customer Name, Invoice Number and other fields, you can scan the documents and SearchExpress can place the customer name in a Customer Name field, invoice number in an Invoice Number field, etc. Database Synchronization will synchronize data in SearchExpress with your ERP (accounting), CRM (customer management) or other systems. For example, after you capture your A/P invoices, when you later pay the invoice, Synchronization could update SearchExpress with the Date Paid and Check Number, by reading this data from your A/P database and writing this data to the SearchExpress database. Search directly from any software application. If you are in your customer management software, accounts payable, or email, just highlight a word or phrase, and press a function key to perform a search and display the documents containing the search phrase. When indexing, speed data entry by looking up information from your business-critical applications. For example, enter a Customer Number and use the Lookup button to fill in the customer name and address, from any SQL or ODBC-compliant database. Pick lists can either be manually entered or read from SQL or ODBC databases, e.g., from your ERP software. Hierarchical pick lists let one pick-list entry control another pick list's entries. Pick-list selection of a particular Client could control which pick-list entries are shown for the Document Type field, e.g., Contract. Pick lists can be used in Scanning, Advanced Search, and Remote Data Entry. SearchExpress is designed for Windows 10/8/7/XP and Server 2016/2014/2012/2008 platforms. You use your browser for many features, such as search and workflow, and you can use any browser device, including iPad, iPhone, or Android. You can choose either on-premises software, or a Cloud version of SearchExpress. See how SearchExpress can save you time and money. Contact us now for a personalized demo. We guarantee your satisfaction. We always offer SearchExpress with a 30 day money-back guarantee.